From left to right; Daniel Combs, Micah Orcutt, Shawn Partin and Thomas Wilson. If you have ever walked by the Upper Plaza on a Friday afternoon, you may have been met by the sight of college students sword fighting. The sword fighters are part of The Bedlam Knights, an SGA recognized and funded club that focuses on recreational sword fights. Zoe Anderson, senior English major, said she has watched the club every once and while and thinks it looks like fun. “It looks like they’re having a lot of fun, and they’re willing to use that space to just express themselves,” she said. Orientation tours often misidentify the group as a Live Action Role Playing (LARPing) group, but the organization has moved far past its LARPing origins. “People haven’t really made the connection that it is just sword fighting. Every tour group mentions the ‘LARPing Club,’ but that’s actually our sword fighting club,” said Shawn Partin, club president. 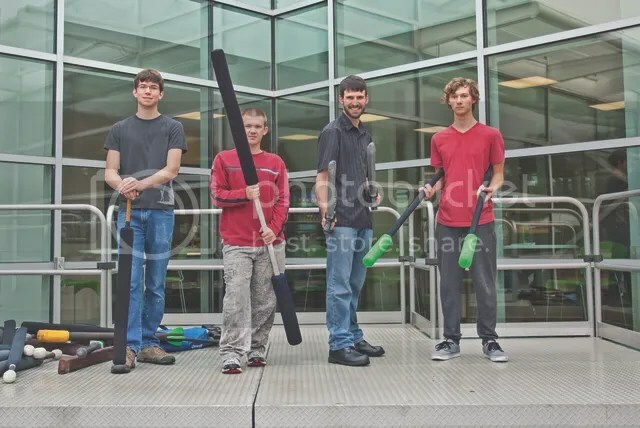 Partin, a senior computer science major, said while the club started out with a focus on LARPing, they have adjusted their cause to focus on recreational sword fighting. “We did actually start out tied in with LARPing. The original club president threw it together as a way of practicing LARPing, which we actually did,” Partin said. “A lot of people on campus sort of decided, ‘Oh, Sword fighting. That looks like fun.’ and so that’s pretty much the core of it now, just giving people the opportunity to do something fun every weekend,” he said. Partin explained that although the group has a Facebook page, its public displays are the primary medium for recruiting new members. “The best way to find out more is to just stop by on Fridays. It pretty much makes people say ‘What on Earth are they doing? Can I join in?’” Partin said. “It’s the sheer novelty of weird people doing odd things, and it actually looks like fun,” he said. Partin said he joined the club after seeing them sword fighting. “Honestly, one day I was walking to the library to start working on an English paper. I saw a bunch of people swinging swords at each other, and I thought to myself, ‘I have to join that, that looks like fun.’” he said. Partin spoke to the misunderstood notion of the club being LARPers. “I’m pretty sure that the rumor that there is a LARPing club actually came from our club,” Partin said. Partin said joining up with other LARPing groups outside of campus is common among club members. “There is another organization, and a lot of our members actually join in with them. They’re called Amp Guard, and that’s something that meets up every Saturday at Palmer Park, and some of our members meet up with them too. They are much more LARPing-oriented,” Partin said. He said everyone is welcome to join the Bedlam Knights. “It’s open to absolutely anyone, regardless of skill level, time constraints or commitment. If you have 10 minutes to stop by on Friday and have some fun, you are more than welcome to,” he said.